Books End owner Jim Roberts celebrates 25 years in business this year. When we interviewed him in the late 90s (along with two other independent bookstore owners), he was facing the threat of superstores and online services. Not only did Books End survive that era (the two other shops closed), but Roberts recently expanded the store (doubled the size). Used, rare and out of print books. From bestsellers to books from the 1700s. What makes a good bookseller? Listening to customers. They will tell you what they want. Also providing good service and having a wide range of interests. Why do small neighborhood stores have such a loyal following? Independent stores are not as homogeneous. Each store has its own personality. In addition, some people like to support local (small) businesses. Homicide by David Simon and Wanted Man by Lee Child. Is Syracuse a good town for books? I don’t know if there’s a bad town for books. 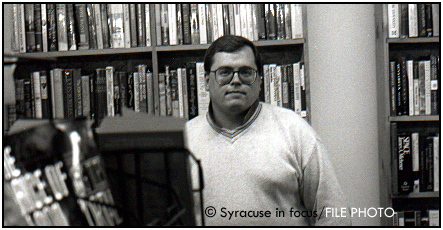 The academic institutions in [Syracuse] help with an appreciation of books and to also increase the quantity. Does the physical book still matter? The physical book is almost perfect in it’s design and function. Holding it in your hands…there’s a certain feel when you turn the pages. Think of the large art books or children’s books with movable parts…And everyone has their own personal library. Some things are hard to duplicate on your Kindle or iPhone. This entry was posted on Thursday, November 29th, 2012 at 12:20 am and is filed under Business. You can follow any responses to this entry through the RSS 2.0 feed. You can leave a response, or trackback from your own site.